Place a biscuit on a floured surface and roll it out to shape it into a disc. Add 1 slice of ham, 2 pieces of pineapple and a little cheese over half of the dough. Fold the dough over to shape it into an empanada. Use your fingers to press down on the sides. Place the little pockets on the lined baking tray. Bake for 15 minutes or until lightly golden on top. You can add potatoes or queso blanco if desired. 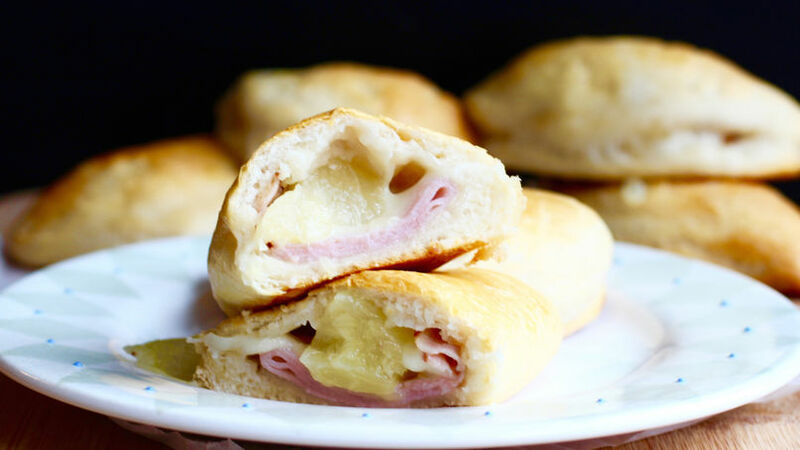 My kids love ham and pineapple pizza, so changing this favorite dish to something even more delicious was a wonderful idea: we made these little pockets with Pillsbury™ Biscuits and stuffed them with cheese, pineapple and ham. This is the perfect recipe to get your kids involved in the kitchen. My kids had a lot of fun making these pockets and they ate them all. This recipe is perfect for those days when you need something easy for the kids and for those times when they show an interest in helping you in the kitchen. You can use as many fillings as your imagination allows and you’re only limited by what’s in your refrigerator. Try them!